Kick off your visit on the 9th (Tue): kick back and relax at Lighthouse Beach and then stroll through Kovalam Beach. Keep things going the next day: enjoy the sand and surf at Hawa Beach, enjoy the sea views from Vizhinjam Lighthouse, and then stroll through Chowara Beach. To see other places to visit, where to stay, more things to do, and other tourist information, refer to the Kovalam tour planning app . Reykjavik, Iceland to Kovalam is an approximately 20.5-hour flight. The time zone changes from Greenwich Mean Time (GMT) to India Standard Time (IST), which is usually a 5 hour difference. In July, Kovalam is warmer than Reykjavik - with highs of 36°C and lows of 28°C. Finish up your sightseeing early on the 10th (Wed) so you can travel to Kannur. Escape the urban bustle at Azhikkal Beach and KIzhunna Beach. Sundareswara Temple and Oorpazhassi Kavu Temple will appeal to history buffs. There's much more to do: kick back and relax at Muzhappilangad Drive-in Beach, tour the pleasant surroundings at Ezhara Beach, enjoy the sea views from Cannanore Lighthouse, and identify plant and animal life at Madayipara. To find where to stay, more things to do, reviews, and more tourist information, you can read our Kannur trip itinerary builder site . Traveling by combination of taxi, flight, and train from Kovalam to Kannur takes 5 hours. Alternatively, you can do a combination of taxi, flight, and train; or drive. Cap off your sightseeing on the 14th (Sun) early enough to travel to Udaipur. Kick off your visit on the 15th (Mon): contemplate the waterfront views at Lake Pichola, get engrossed in the history at City Palace of Udaipur, and then contemplate in the serene atmosphere at Jagdish Temple. To see maps, other places to visit, photos, and more tourist information, use the Udaipur trip planner. Traveling by combination of train and flight from Kannur to Udaipur takes 7.5 hours. Alternatively, you can do a combination of train, taxi, and flight; or drive. In July in Udaipur, expect temperatures between 37°C during the day and 30°C at night. Finish your sightseeing early on the 15th (Mon) to allow enough time to travel to Agra. Tourism in Agra revolves around two words: Taj Mahal. On the 16th (Tue), explore the historical opulence of Agra Fort, then don't miss a visit to Jahangir's Hauz, and then admire the striking features of Taj Mahal. For reviews, more things to do, maps, and more tourist information, read our Agra trip planner . Traveling by combination of flight and train from Udaipur to Agra takes 5.5 hours. Alternatively, you can drive; or take a bus. In July in Agra, expect temperatures between 40°C during the day and 31°C at night. 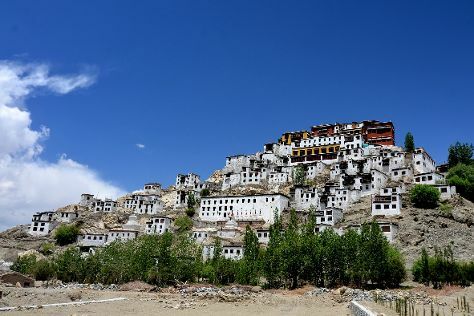 Finish your sightseeing early on the 16th (Tue) to allow enough time to travel to Leh. Your inner history buff will appreciate Thiksey Monastery and Gurdwara Pathar Sahib. Hall of Fame and Stok Palace Museum will appeal to museum buffs. Next up on the itinerary: capture your vacation like a pro with an inspiring photography tour, take in the spiritual surroundings of Basgo gompa, steep yourself in history at Riasi Fort or Zorawar Fort, and stop by De Pashmina Emporium. For photos and more tourist information, go to the Leh travel route builder app . Getting from Agra to Leh by combination of train and flight takes about 5 hours. Other options: drive. Wrap up your sightseeing on the 19th (Fri) early enough to travel to Jaipur. Kick off your visit on the 20th (Sat): get engrossed in the history at City Palace of Jaipur and then step into the grandiose world of Amber Palace. Get ready for a full day of sightseeing on the 21st (Sun): look and learn at Jantar Mantar - Jaipur, then look for all kinds of wild species at EleSafari, then look for all kinds of wild species at Elefriend, and finally look for gifts at Royal Spices And Tea. To see more things to do, traveler tips, and other tourist information, you can read our Jaipur planning website . Getting from Leh to Jaipur by flight takes about 4 hours. Other options: do a combination of flight and train; or drive. In July, daily temperatures in Jaipur can reach 40°C, while at night they dip to 30°C. Wrap up your sightseeing by early afternoon on the 22nd (Mon) to allow time for travel back home.